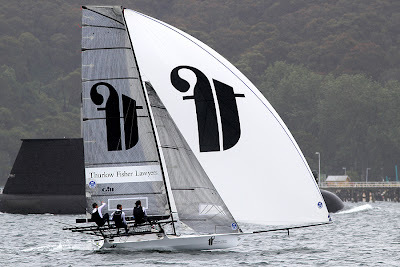 Michael Coxon, Dave O’Connor and Daniel Nixon brought Thurlow Fisher Lawyers home a35s winner of Race 5 of the 3-Buoys Challenge on Sydney Harbour today. Appliancesonline.com.au (Micah Lane, Paul Montague and Tom Anderson) finished in second place, with series leader Lumix (Jonathan Whitty, James Hozack and Aron Everett) a further one minute and one second back in third place. The Kitchen Maker (Josh Mc Knight) was next, followed by Yandoo (John Winning) and Coopers 62-Rag & Famish Hotel (Jack Macartney). Sydney continued to produce dreadful weather for the event with a heavy rain squall just before the scheduled start, which forced a short postponement. 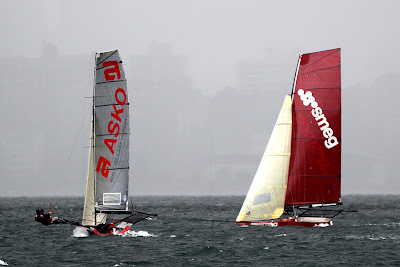 In a 15-18 knot Southerly, the start was dramatic at both ends of the line as Gotta Love It 7 (Seve Jarvin) was declared OCS at the pin end while Sydney City Marine (David Witt) and Viagogo (Alexandra South) collided near the start boat. 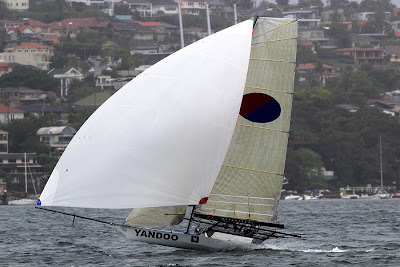 The ‘7’ team either didn’t notice the recall or ignored it as they powered into the lead on the first windward beat to the 3-buoys. 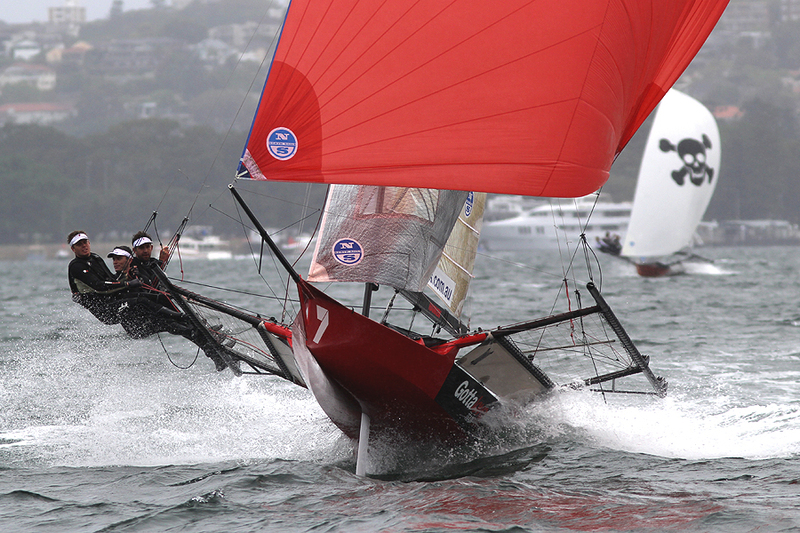 Gotta Love It 7 continued to lead around the course, but the official race behind the skiff was producing some great racing. Coopers 62-Rag & Famish Hotel led the fleet down a flying spinnaker leg with appliancesonline.com.au, De’Longhi-Rabbitohs (Simon Nearn) and Thurlow Fisher close behind. Aside from a capsize by De’Longhi-Rabbitohs, the leading three teams held their positions, while The Kitchen Maker led the next group just ahead of Mojo Wine (Chris Nicholson), which was one of the few skiffs carrying the big number one rig. 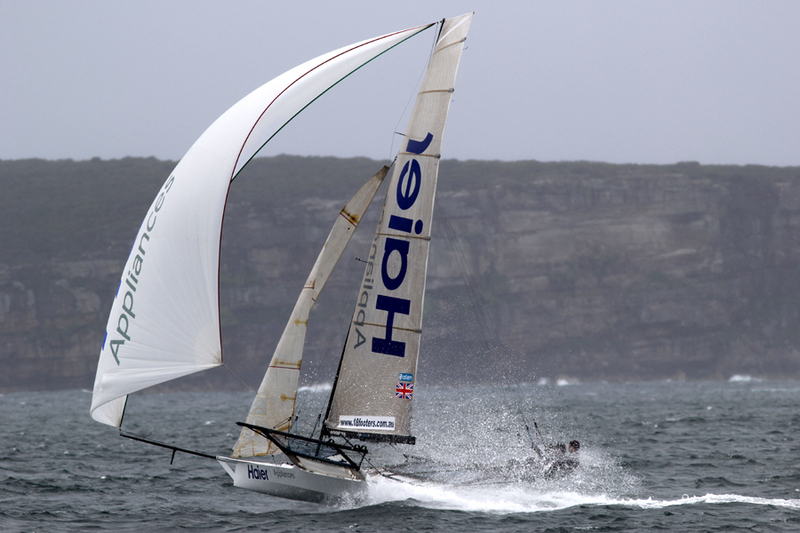 The UK team, led by Rick Peacock, on Haier Appliances were also showing their potential as they were in sixth place just ahead of Rabbitohs-Kenwood (Brett Van Munster), Yandoo and Lumix. Thurlow Fisher Lawyers established a narrow lead over the second of the 3-lap course as appliancesonline.com.au moved ahead of Coopers 62-Rag & Famish. While positions didn’t change too much over the final lap, the racing was a great spectacle as the skiffs showed tremendous speed downwind as they raced past the spectator ferry. 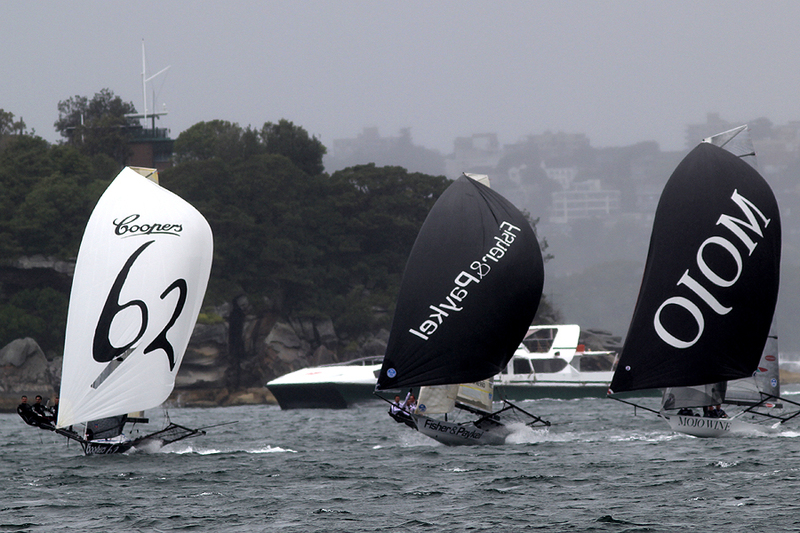 The southerly wind made it more like a mid winter day and all competitors were glad to get back into the warmth of the clubhouse.